Translated to mean man root in Chinese, the name ginseng premises on the belief that the roots, with their attached limbs, resemble a human being. Due to its perceived kinship with the gods, the Chinese named it the root of immortality. Indeed, being closely associated with longevity and masculinity, the ginseng has always been regarded as the King of all tonics among the Chinese. In 18th century American folklore, ginseng was thought to have the powers to frighten spirits away. The Jesuits exported it as a valuable commodity, along with rare furs, and this was how the American Indians came to be acquainted with its valuable medicinal properties. The Latin name of ginseng is panax, which means panacea. Like the Asian ginseng, the Panax variety is believed to be imbued with masculine properties. Soviet cosmonauts used Siberian ginseng for alertness in outer space. Siberian ginseng (eleuthero) is a native spring shrub in the woodland areas of Siberia and Korea while Panax is a herbaceous perennial that finds its fertile ground in North American forests. 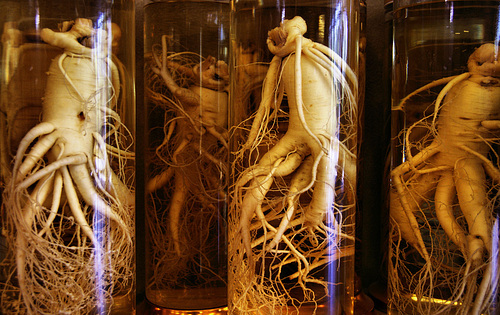 The value of ginseng lies mainly in its roots, which have plenty of branches and flesh. They take at least six years to mature and should not be harvested early. To ensure that the numerous root limbs attached to the main root do not break off when harvested, the ginseng should be unearthed carefully and dried for at least one month before use. Ginseng has thin stems with 5 to 6 veined leaves each. Tiny flowers cluster near the main stem. Cultivation of ginseng is now done with extreme care as the once-plentiful supply has almost decimated, thanks to escalating popularity. It comes as no surprise then that ginseng seeds now come at a heavy price.